February 14, 2019 – Just last month, a young lioness had her claws brutally and amateurly removed with garden shears leaving the animal mutilated and suffering. The reason behind the excruciating procedure is that the owner of the zoo allows his children and visitors to play with the 14-month-old lioness. Her claws were removed to reduce the risk of human injury. FOUR PAWS International, the global animal welfare organization, has obtained shocking footage from inside Gaza's oldest zoo in Rafah. FOUR PAWS strongly condemns the brutal amputation and demands the closure of the zoo, where over 40 animals are kept in dreadful conditions. The animal welfare organization has already opened negotiations with the responsible authorities. The footage of the mutilated lioness comes just weeks after four lion cubs froze to death at the same zoo. For big cats such as lions and tigers, removing the claws is a particularly vicious procedure with long-lasting damage. Natural behavior, such as grabbing food or climbing, is hardly possible without an animal’s claws. Concerningly, since the amputation was not done in a proper vet clinic, the chance of infection is high. "Claws are, so to speak, the fingers and toes of lions. Their removal is animal cruelty and forbidden worldwide. This brutal procedure is often compared to the amputation of all fingers of a human up to the first knuckle. We are shocked that the owner of Rafah Zoo allowed this procedure. The motives are also distressing. For humans a lion is a dangerous predator and not a playmate. The zoo owner has once again shown that he is irresponsible with the lives of humans and animals. We urge the responsible authorities to close the zoo and find the best solution for the animals. FOUR PAWS is ready to help." FOUR PAWS veterinarian Dr Amir Khalil, who has extensive experience in such rescue missions, having evacuated two zoos in Gaza in 2014 and 2016. The small zoo in Rafah was opened in 1999 and is in the southernmost part of the Gaza Strip, close to the border with Egypt. From there, wild animals are repeatedly smuggled through underground tunnels to and from Gaza. Since the opening of the zoo, many animals have already died due to rocket attacks and war battles. Some of them have even been stuffed and are still on display. Currently, 49 animals – including five lions, a hyena, several monkeys, wolves, emus, cats, dogs and exotic birds – live in tiny and desolate cages at Rafah Zoo. Poor keeping conditions as well as lack of food and medical care have left their mark on the animals, whose welfare is of primary concern for FOUR PAWS. At the beginning of the year the zoo made headlines after four lion cubs froze to death. 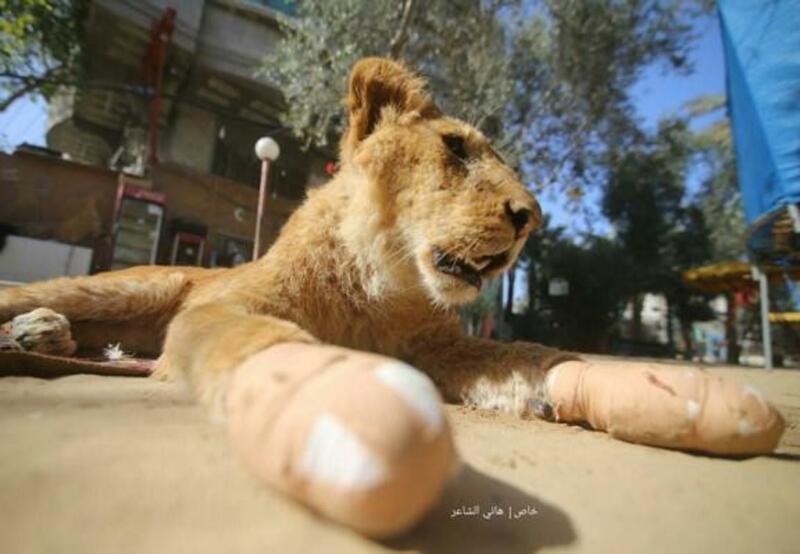 FOUR PAWS is committed to finally putting an end to the suffering of the animals of Rafah Zoo. The first negotiations with those responsible have already begun. FOUR PAWS has been active in Gaza since 2014 and has already evacuated and closed two zoos – Al-Bisan zoo and Khan Younis zoo – in the region. The former zoo inhabitants were transferred to FOUR PAWS' own sanctuaries. The zoo in Rafah is well known to the international animal welfare organization. In 2015 the owner of the zoo sold the two lion cubs Max and Mona to a local citizen, who gave them to his grandchildren as a gift. Photos of the two lions in the middle of a refugee camp went around the world, shocking the global community. FOUR PAWS confiscated the cubs and brought them to its sanctuary in Jordan, where they are now thriving in species-appropriate care. "We urge the responsible authorities to close the zoo and find the best solution for the animals." Dr. Amir Khalil explained again. "FOUR PAWS is ready to help."